As part of our final meeting of the year, our Cotton Mill Quilters' Guild is having it's annual silent auction. This year, our members are making nice things that we will bidding on at our annual pot luck luncheon, and silent auction. We are to invite a guest to help the purchase and bid population. The funds go towards the purchase of supplies for making quilts for the needs of the community. I have several things made already for the auction, and I'm working on a few more mystery things. But, the kiddos were here last night and we made charm bracelets for them. That got me to thinking about making something with my crystals and charms for our silent auction. 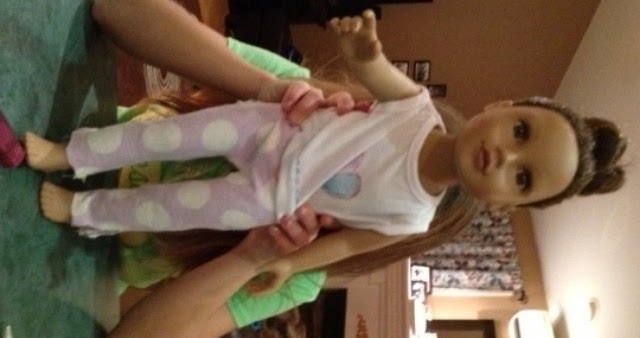 So, here is my creation... I've made two... but I'll only show you this red one. The other one, you'll have to come to the auction to see. It's about 2 inches wide. What is it, you ask? It's a shawl pin or it could be pined to the bottom of your guild name tag. Do you like it? The more important question, who is going to be my guest at our silent auction and pot luck? Are you available on on Dec. 10th? Kiddos sewing on their own. A quiet day yesterday, cleaning up my sewing room a bit. Made a small list of things I wanted to do, just in case I got distracted.. Yep, distraction happened. A good one though. Caitlin and Grace came for a visit in the afternoon. I was so impressed with what they had to show me. They had designed and sewed a jacket for their doll. I was thrilled at how it came out. They even hand-sewed two buttons on. I was so proud of them... They were excited about their creation and wanted to make more clothes. They took a bunch more fabric home to make more clothes for them.. I can't seem to turn these photos the right way... but here you can see the two outfits they made after they went home with their fabric stash loot. 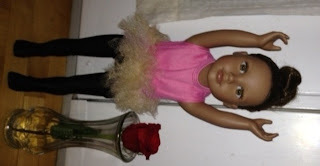 After they got home, they sent me a picture of their doll with a new tutu and a new pj bottoms. Cute, eh! At guild last year, everyone was making little snappy bags. When you open them, they make a snap noise and they close up automatically. It is just big enough for a few small things. I saw this ruffled one last week I thought it was just sweet. This afternoon I took the time to make one. I really like it. It's about 5" wide. I need to find a good use for this little pouch....then I'll make more. Maybe it will hold a small gift for a teacher... maybe a lipstick or two in my purse. The pattern is free on the internet here. So what would you put in this little snappy bag. I've had my Ipod nano for two years. When I go for my healthy walk each day, I like to listen to my favorite radio station 92.3FM. Every song is a classic and I just love walking to the old familiar music. I keep the pedometer turned on and like to measure in steps, any new routes. Yesterday... A milestone. Two Million "documented" steps in two years. I rolled over the Two Million mark just as we were almost home. I say documented because sometimes I forget to charge the pedometer, sometimes I just forget to bring it. 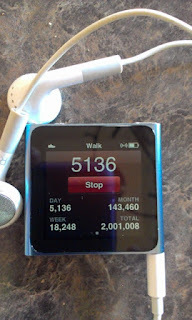 So how far is two million steps, you ask. My regular daily walk is about 5500 steps. We measured it off to be 5 kms So that simple math says that we've each walked about 1818 kms in two years. Now it makes sense as to why |I have to buy sneakers so often. I bought a new pair of sneakers to celebrate this milestone. I love fruitcake during the Christmas season, and long after for that matter. For years I've been making a white and a dark fruitcake. These recipes came from the Daily Gleaner in 1994. I needed a change. I picked up my fruitcakes on the weekend from Linda's. At the last minute, we decided to put some brandy on it. We put about 1/4 cup on the two loaves with a pastry brush... so its not much. I've cut each fruitcake in 3 pieces and wrapped well and they are curing in the cold room. In a few weeks, we'll start taking them out for the holidays. So, have you ever made fruitcakes with a friend? If not, you should. It's a fun thing to do as we prepare for the upcoming holidays.. I'm teaching a mini-class tomorrow. It's on Free Motion sewing and for small number of confident stipplers. They want to take their free motion sewing and quilting up a step. I have been preparing for this class for a few weeks now. 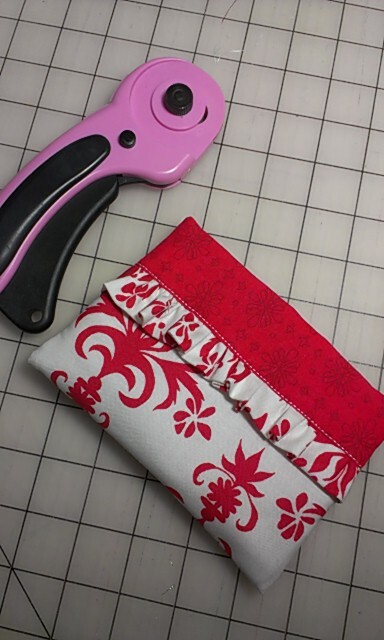 In addition to making samples, preparing hand-outs, collecting samples to show, and preparing fabric sandwiches to demonstrate, I've been getting familiar with a borrowed Babylock Jane sewing machine. It's almost exactly like my straight stitch machine that I use every day. I'm so glad that I have the use of this machine for my classes. It saves me from taking down my machine. Many thanks Holly! I'll be sharing a number of techniques and tricks with my class. But some of you may know this, the real key, is to practice, practice, practice. Anyway, tomorrow's students will give me feedback on the class in preparation for a larger sized and longer class next Saturday. So, are you a confident stippler? This summer I made a little drawstring laundry bag for each of the kiddos who came to Grammie Camp. This l It finishes at about 17" wide x 19"high. I am really loving my small projects that incorporate linen and I thought I'd share a little picture tutorial with you. The Grammie camp theme was lady bugs, so we used red accent fabric and ribbon and added a lady bug to the project. You can use any colors you like. If you make one with different colors. Let me know. I'd love to see. Since linen ravels, do a surge or zigzag around the linen piece. of your laundry bag smooth and seam-free. Your seam will be covered with ribbon. Stitch down your ribbon to cover the seam. whole top. This makes the drawstring channel. down the side and bottom. Leave an opening below the fold. Iron open the seam and stitch down the seam allowance. This will help when the drawstring gets passed through. From the right side, slide in your drawstring through the opening. you put both ends through the spring clip. The hand-quilters at St. Dunstan's have picked the next quilt for me to make for their next raffle quilt. Since the number of their hand-quilters are declining, they chose a simple design, that can have a bit less hand stitching on it than some of their previous raffle quilts. They chose "Blackford's Beauty". You might have seen this free pattern on Quiltville. Bonnie calls it "Jared takes a wife". We will call our quilt by it's traditional name, "Blackford's Beauty". It is a beauty for sure. In my stack of photos, I showed the ladies this one done by Alice K. and it was displayed at one of our guild's quilt shows back a few years ago. It's no mystery why they chose it. It's stunning. They love how Alice hand quilted it and they suggested they might like to do the same. So, sewing this quilt top will be my December/January project. Want to make a gift for a new mom. Here's something guaranteed to make her smile, and then she'll make her baby smile later on. Main red fabric 19" x 4"
First step is to make a scrunchie. Iron one short end of the red fabric under by 1/4". Fold in half longways, and stitch 1/4"
Turn right side out, and thread your elastic in through tube. Place raw edge end into the folded under end and pin. Top stitch to secure your scrunchie. Sew two circles together, twice for the eyes. Add black circles for the pupils of the eyes. Place Eyes up slightly and pin. Stitch around each eye. Place orange nose, and stitch. Last month, our guild hosted the Miramichi Guild for a mystery workshop day. We had a great day, and you can see lots of pictures on our guild's blog here. We made a Style File portfolio pattern by Karen Montgomery. I loved making this small project and thought that if the size was cut down a bit it would make a nice IPAD case. My sister was visiting and I tested her Ipad in it. It's a good fit. I like it. I don't have an Ipad, so this one will go in our guild's silent auction next month. Meet Venus de Milo. She is one of the big attractions at the Louvre. It was amazing to see her and the Mona Lisa too. But my favorite was a Vermeer painting of a girl hand stitching. I have a picture of her on my big camera. I'll show it next week when I get home. My trusted little netbook won't charge here in Paris, so using my smartphone.